Axles - Heavy Trucks | Cincinnati Automation Ltd. This system consists of two single cameras, to confirm correct lug screws on an axel assemble. 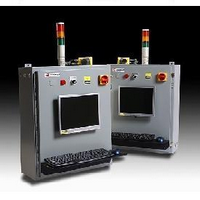 The system consist of a part in station trigger and a pass/fail indicator. Numerous part numbers can be pre-programmed and then selected from a wireless bar code scanner. Custom software was developed for automatically selecting the required inspection based on an embedded code within an SQL lookup table.